I’ve encountered the Vivat label before, admiring the Couperin Trois Leçons de Ténèbres (review) which can be found there. The same high standard of presentation is to be felt with this release of Purcell’s Ten Sonatas in Four Parts, a collection among several published by the composer’s widow Frances. These works are ably put into context in Robert King’s substantial booklet notes, which also give useful descriptions of each sonata. Set in an intimate acoustic, this is a superbly un-churchy set of performances which expressively communicate Purcell’s gorgeous little harmonic chromatic clashes and melodic sighs without mannered emphasis or excessive reverence, and dig into those lively dances while maintaining the sense of formality and control which is a characteristic of the period. The confiding conversational relationship between strings and the round tones of the small organ is lovely, the theorbo audible but not forward in the mix so we get the notes rather than constant plucking. Livelier dance numbers with harpsichord make a nice contrast, but again the keyboard is balanced respectfully, adding resonance and rhythm without scratching at tour eardrums. It almost goes without saying that Robert King’s continuo playing is interesting and sensitive without being overly fussy and stuffed with too many extra notes and arpeggios. String playing follows the authentic minimal-vibrato approach, but if you listen carefully you will actually hear a fair amount of vibrato, used as expressive ornament rather than as a colour to the tone or means of projecting the sound. 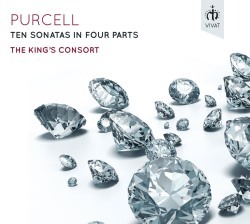 Purcell’s Sonatas are often mixed up in programmes with selections from the three and four-part pieces together, but there are a few collections of the Ten Sonatas together. The Purcell Quartet’s recordings on Chandos (review) were re-released in 2000 but are now once again not that easy to find other than as downloads. The June 2009 ‘Download Roundup’ mentions the Retrospect Trio’s recording on the Linn label, seen by Brian Wilson as a satisfactory alternative to the Purcell Quartet. There is also another fine recording by The Locke Consort on Channel Classics, but the market is not exactly awash with versions of these works. Of the above, the Retrospect Trio is crisper sounding than the King’s Consort with its more frequent use of harpsichord, but still very nice. The Purcell Quartet uses organ to fill out its sound and is also very fine, though without as much rhythmic bounce the dance pieces don’t inspire one to move about quite as much as the other recordings. Comparing these versions, this recording by The King’s Consort comes top of the pile in my opinion.